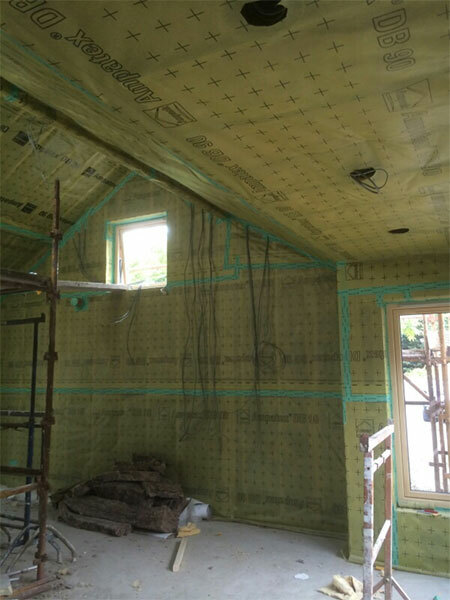 Airtightness is the control of air leakage, i.e. the elimination of unwanted draughts through the fabric of the building envelope. This can be achieved using special membranes & tapes at the construction stage. Only when the construction is airtight can warm air be retained within the building and cold air kept outside. This prevents unpleasant draughts and will mean greater comfort in the building along with lower heating costs. Airtightness also protects the building fabric against damage, helping to maintain its appearance and extending the buildings life. Prior to slabbing & plastering, the membrane is installed along all timber surfaces and around window & door frames. The membrane is installed on the warm side of any ceiling insulation. The construction process continues with slabbing & plastering. It is vital that all trades are made aware of the membrane. Any penetrations such as wires or plumbing pipes must be prepared with tapes or grommets to ensure the air tightness is not compromised.